McGill University’s Institute of Air and Space Law (IASL) and the International Federation of Air Line Pilots’ Associations (IFALPA) are delighted to announce that they have partnered to offer a pre-professional internship to current students and recent graduates of the IASL. This new IFALPA internship will offer students and recent graduates of the IASL an opportunity to use their legal, business and administrative knowledge, gain work experience, and grow their network in the areas of IFALPA’s business and professional activities. At least one intern will be selected by the IFALPA for a three-month work term each academic year. The program is open to students currently registered in the IASL’s LLM program and to graduates who have completed the IASL’s LLM program within three years of the application date. 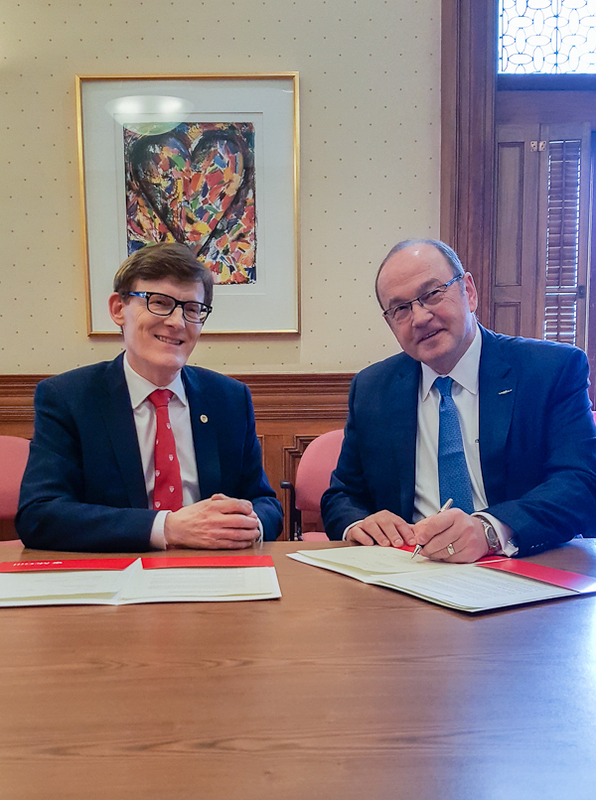 On Thursday, March 28, 2019, a ceremony was held at McGill’s IASL to mark the signing of a Memorandum of Agreement by IFALPA President, Captain Ron Abel, and IASL Director, Professor Brian F. Havel, to officially establish the program. The Director of the IASL, Professor Brian F. Havel, welcomed the signing of the Memorandum of Agreement between IFALPA and the IASL, noting that this internship opportunity “is the latest in a series of student internships that the Institute has secured with Montreal-based international aviation and space organizations.” He is particularly pleased that IFALPA has shown its confidence in the Institute’s academic reputation and in its graduate students through the organization’s support for the internship. An international non-profit organization, IFALPA member associations represent over 100,000 pilots in nearly 100 countries. IFALPA’s mission is to promote the highest level of aviation safety worldwide, and to be the global advocate of the piloting profession; providing representation, services, and support to both its members and the aviation industry. Visit www.ifalpa.org for more information.